Seventh municipality in Japan begins registering LGBT couples, continuing march to greater equality in the country. Southwest Japan's Fukuoka Municipal Government on Monday began recognizing LGBT couples this week, becoming the seventh municipality in the country to offer such registrations after Tokyo's Shibuya Ward began in 2015. Fukuoka Mayor Soichiro Takashima handed the first official partnership certificate, which does not give legal rights similar to marriage but will be recognized by government housing and public hospitals, to a couple at City Hall. 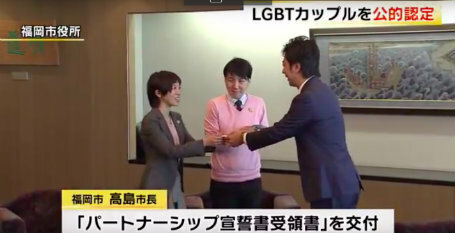 "We've already spent our lives together as a family but we're happy (to be recognized) because we feel like we received congratulations from society," said Anri Ishizaki, a 33-year-old representative of a support group for LGBT people, according to Kyodo news agency.